Summer at the SDH has been off to a great start so far! Rose had the opportunity to visit the house a couple weekends ago and she was able to implement several great changes. Efficiency United has initiated an energy audit and donated 8 LED bulbs, a couple of low flow aerators for the sinks, and some shower heads. The Efficiency United program is intended to provide assistance and incentives to customers who employ energy efficient measures. Programs offer rebates on natural gas water heaters, clothes washers, pipe wrap, water heaters, furnaces, boilers, and thermostats. Incentives will be provided to the home owner and based on fulfilling energy efficiency standards. We will report later on our starting “Energy Score” once the audit is completed. On residential bills there is a line item entitled MI Energy Efficiency Charge. Both your gas supplier and your electricity supplier collect this fee to pay for this program. These donations were placed where they were most needed in the house. One of the shower heads on the main floor initially had a flow rate of 8.78 gallons per minute (gpm). Upon replacement with a low-flow shower head, the flow rate has been reduced to 2.5 gpm. One of the upstairs shower heads was also replaced to reduce the water consumption. The other two showers already have low flow rates (1.94 gpm, 2.5 gpm) so these do not need to be replaced. Replacing the aerators was a bit more challenging. A lot of the existing aerators were extremely corroded and they broke when pliers were used to remove them. Rose did manage to get most of them off though. 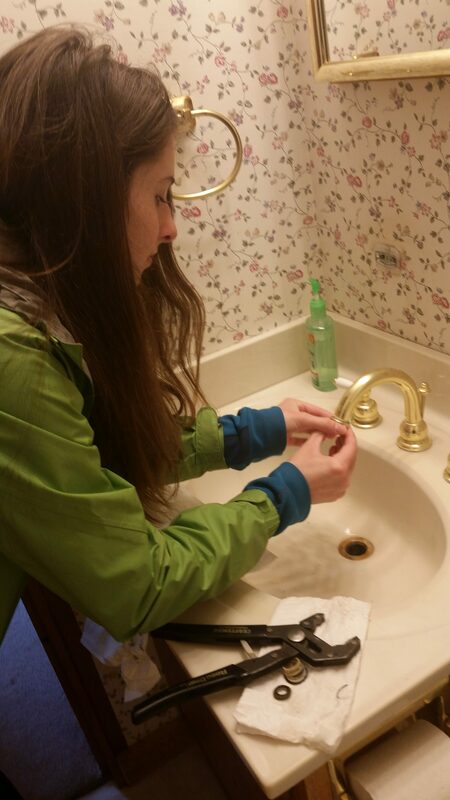 However, the donated aerators only fit on certain sinks and therefore, they had to be replaced in specific rooms in the house. The sinks in the two upstairs bathrooms, the kitchen sink, and the laundry room sink all had water spouts onto which the aerators fit properly. All of these were replaced with 1.5 gpm aerators. The remaining aerators will be replaced when we receive the correct size. Additional flow rate tests will be conducted in the fall to verify the flow rates of the new shower heads and aerators. 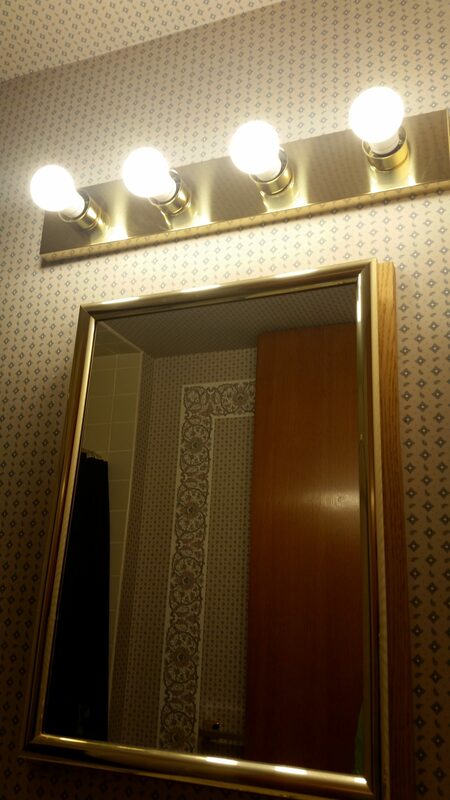 Finally, the LED light bulbs were installed in the upstairs bathrooms. 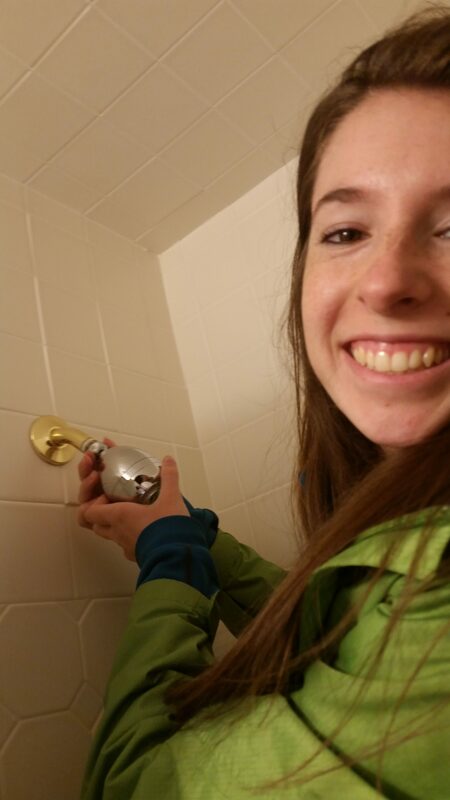 With the bulb donations we received, 8 incandescent bulbs were replaced, and the bathrooms look great! However, the results of our lighting survey showed that there are a total 131 light bulbs scattered throughout the house. Specifically, we need 32 more A19 size LED lights. We will accept lights sent to the following address or money to purchase them. All donations are tax deductible in Michigan. Actual lights can be sent to our advisor, Jay Meldrum, at MTU/KRC, 23630 Airpark Blvd, Calumet, MI 49930. That’s all we have for now, but we will be sure to keep you updated as more exciting changes come about throughout the summer. Hopefully your summer has been a good one so far!